If you're looking for a place to stay with fewer rooms than a hotel and a more personalized environment, picking a bed and breakfast in Chennai may be the perfect thing for your trip. 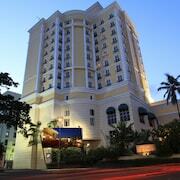 There are 633 lodging options and 7 B&Bs in Chennai, so you can find something that meets your needs. B&Bs all have a unique charm— whether it's a comfy common area with a fireplace or a sunlit breakfast nook to enjoy your morning cup of coffee, the small details are what make bed and breakfasts the perfect escape. If museums are at the top of your list when you venture out to explore Chennai, Government Museum and Theosophical Society Headquarters are worth a stop. 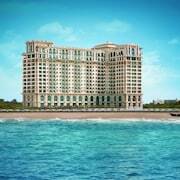 Travelers who want to explore the sights in Chennai will enjoy its temples and shopping. If you'd like to see some of the area's cultural attractions, Raja Muthiah Hall and Government Museum are some worthy spots to check out during your visit. What Are the Best Transportation Options in and Around Chennai? Fly into Chennai (MAA-Chennai Intl. ), which is located 2.9 mi (4.7 km) away from the city center. If you'd like to venture out around the area, you may want a rental car for your journey.